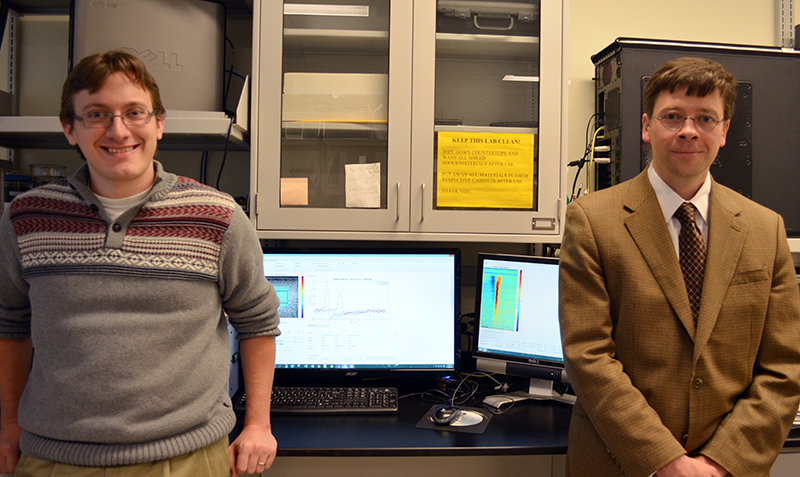 Graduate student Jonathan Langdon (left) and Professor McAleavey (right) in the lab. The patent titled “Methods and Systems for Spatially Modulated Ultrasound Radiation Force Imaging“ (US 8753277) has recently been assigned to the UR with inventor Stephen A. McAleavey. The patent describes a new method for using ultrasound to determine the shear modulus of a tissue noninvasively. Changes in shear modulus of tissues can be associated with certain pathologies, such as cancer and liver fibrosis. Thus, Professor McAleavey’s new ultrasound technology holds great promise for increasing early detection and diagnosis of disease in patients. Stephen McAleavey is an Associate Professor of Biomedical Engineering, and member of the Rochester Center for Biomedical Ultrasound (RCBU).